Thanks to Dr. Saroona Haroon, King Fahad Specialist Hospital, Buraidah, Al-Qassim (Saudi Arabia) for contributing this case and Dr. Hillary Zalaznick, Myriad Genetics, Inc., Utah (USA) for writing the discussion. To contribute a Case of the Week, first make sure that we are currently accepting cases, then follow the guidelines on our main Case of the Week page. (1) We have now posted Superpages for all chapters. The Superpage contains information from all chapter topics, in alphabetical order. There is a Superpage for all content, for images and for virtual slides. Thus, you could use it to see all content on the Appendix, all Pancreas images or all Breast malignant virtual slides. The Superpage links appear in the Table of Contents just before the alphabetical list of topics. Note that they only work when accessed from our site - copying the link will not work. (2) We now have over 350 Board Review type questions posted on our Board Review page. We are thinking of grouping chapters by subspecialty. We now also have a direct link to them from the Mobile Home Page. Are there any other changes we can make so this page is more useful to you? (3) We have now added an Instagram button to the header at the very top of our pages. Please follow us there, as we post interesting pictures from cases we receive. The link is https://www.instagram.com/pathoutlines/. A 32 year old man presented to the maxillofacial outpatient department with swelling of the right masseter for three months. On examination, there was a firm, non-tender and circumscribed swelling. MRI of the craniocervical joint showed a localized 3.1 x 2.4 cm mass of low signal intensity on T1 weighted images and an inhomogeneous mixed signal on T2 weighted images. 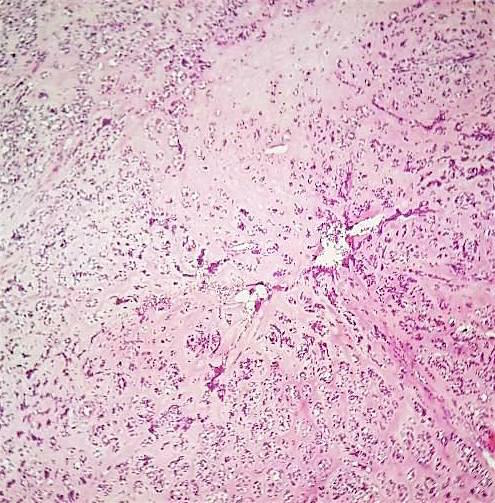 Sclerosing rhabdomyosarcoma, originally called sclerosing pseudovascular rhabdomyosarcoma, is a rare subtype of rhabdomyosarcoma (~1%) that is currently classified by the WHO under the heading of spindle cell/sclerosing rhabdomyosarcoma. It is seen in both children and adults, with a peak in the first decade and a mean age in the late 20s. The head and neck is the second most common location after the extremities (Head and Neck Pathol 2013;7:193). The typical presentation is a slowly growing mass (Goldblum, Folpe and Weiss: Enzinger and Weiss’s Soft Tissue Tumors, 6th ed. 2014). On gross examination, the tumors are tan-yellow and rubbery. The border is usually infiltrative and the tumor can erode through bony structures (Goldblum, Folpe and Weiss: Enzinger and Weiss’s Soft Tissue Tumors, 6th ed. 2014). 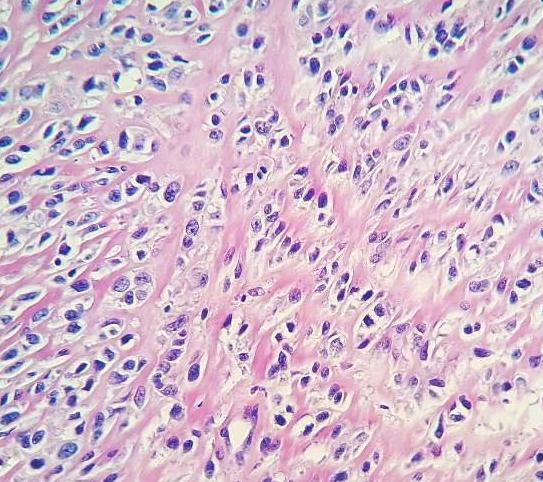 The characteristic histologic feature is the densely hyalinized stroma that resembles osteoid or a chondroid matrix. The cells are small and blue and grow in clusters, cords and pseudovascular structures. The nuclei have irregular contours, coarse chromatin and small nucleoli (Goldblum, Folpe and Weiss: Enzinger and Weiss’s Soft Tissue Tumors, 6th ed. 2014). 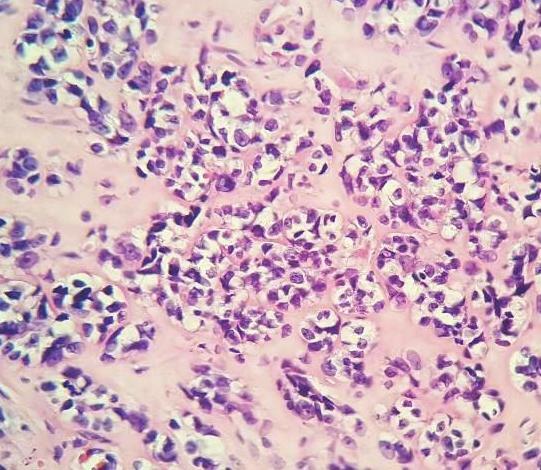 In about one third of cases there can be areas of spindle cell growth with rhabdomyoblastic features. Strap cells can be present but this is uncommon. 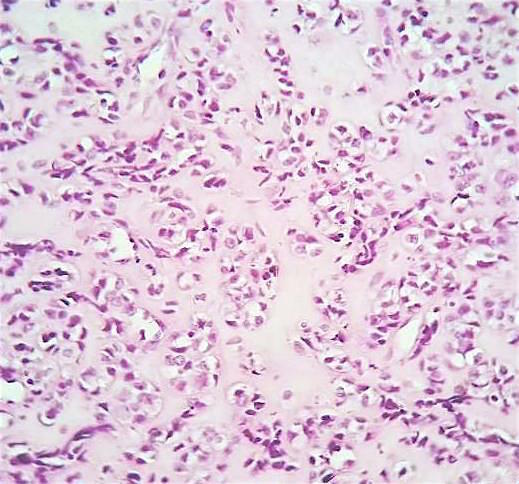 Rarely reported histologic findings include large, anaplastic cells with microvesicular steatosis and multinucleated giant cells. Mitotic activity is generally high, up to 25 mitoses per 10 hpf (Head and Neck Pathol 2013;7:193). 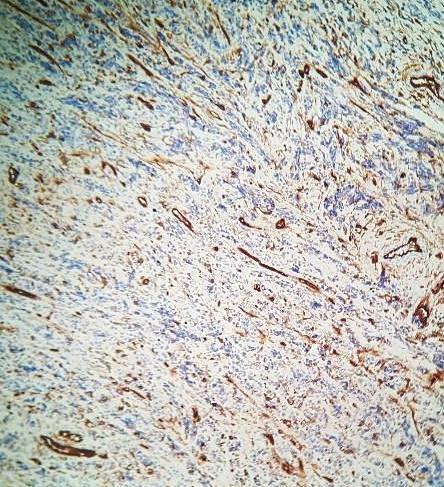 On immunostains, sclerosing rhabdomyosarcoma can show a distinctive focal and dot-like desmin staining pattern. 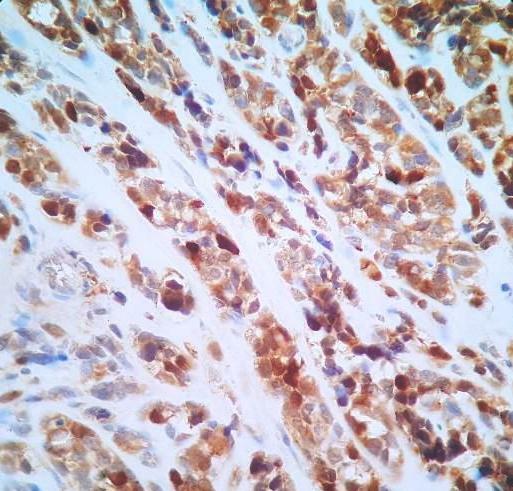 Staining for myogenin is focal/weak or negative, but MyoD1 is strong and diffuse (Goldblum, Folpe and Weiss: Enzinger and Weiss’s Soft Tissue Tumors, 6th ed. 2014). 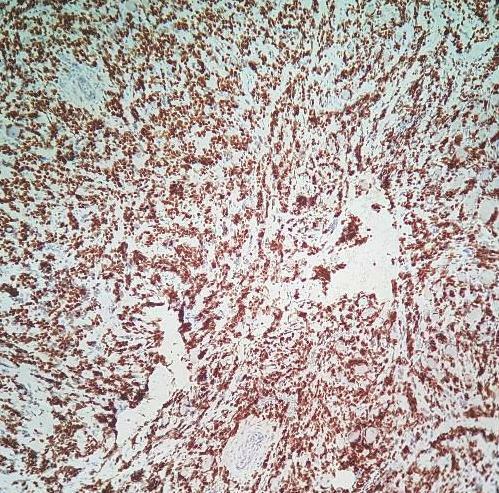 Tumor cells can show variable positivity for several markers including vimentin, WT1, CD99, CD56, calponin, p53, MDM2 and BCL2 (Head and Neck Pathol 2013;7:193). 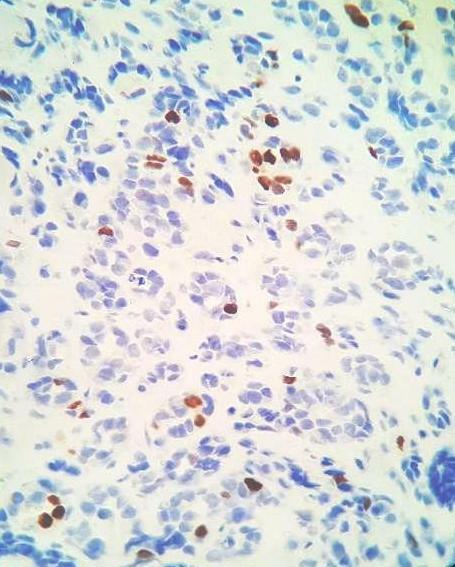 This particular case showed focal positivity for S100 and occasional cells positive for CD34, CD31, HMB45, LCA, cytokeratin AE1 / AE3, synaptophysin and EMA; Ki67 was >50%. 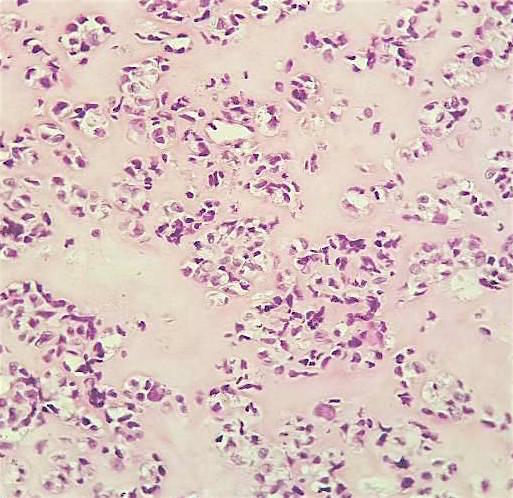 The differential diagnosis of sclerosing rhabdomyosarcoma includes other soft tissue tumors such as sclerosing osteosarcoma, extraskeletal myxoid chondrosarcoma, mesenchymal chondrosarcoma, sclerosing epithelioid fibrosarcoma and angiosarcoma. 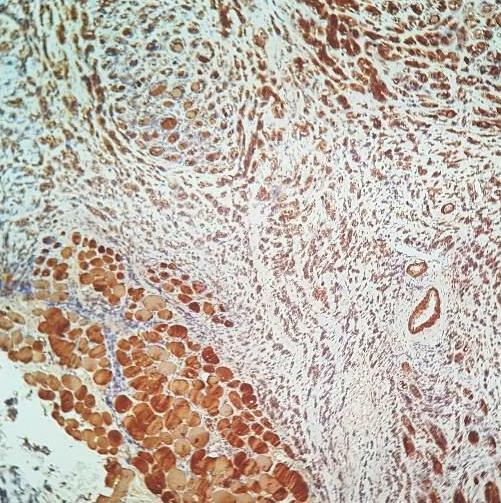 In this particular patient who presented with a mass near the parotid, the differential diagnosis would also include matrix-rich salivary gland tumors; for example, the stroma of sclerosing rhabdomyosarcoma can form cylinders that resemble adenoid cystic carcinoma and in one case report of a parotid tumor, the cells were plasmacytoid and resembled myoepithelial cells. 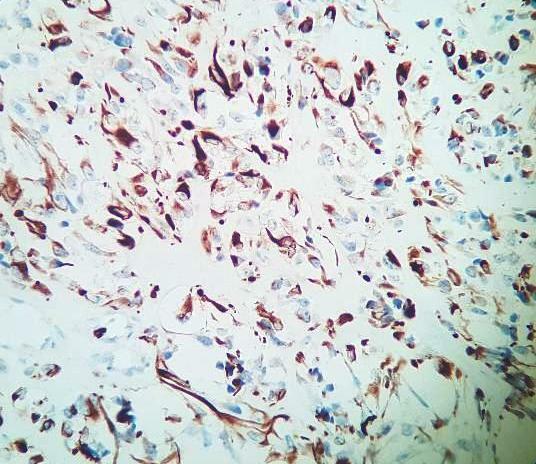 For any of the above differentials, a positive desmin, myogenin or MyoD1 stain would ultimately confirm the diagnosis of rhabdomyosarcoma (Head and Neck Pathol 2015;9:147). 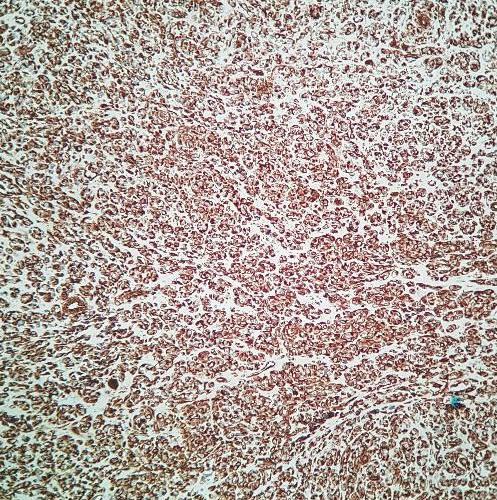 A recent study identified a MYOD1 (L122R) mutation in 7/9 cases of sclerosing rhabdomyosarcoma (78%) and 3/12 spindle cell rhabdomyosarcomas (25%). Seven of the ten positive cases occurred in the head and neck (Modern Pathology 2016;29:1532). Other reported genetic alterations of sclerosing rhabdomyosarcoma include complex hyperdiploid karyotypes with gains of different chromosomes, loss of 10q22 and Y with trisomy 18, amplification of MDM2 and HMGA2 (Goldblum, Folpe and Weiss: Enzinger and Weiss’s Soft Tissue Tumors, 6th ed. 2014) and PIK3CA mutations (Modern Pathology 2016;29:1532). 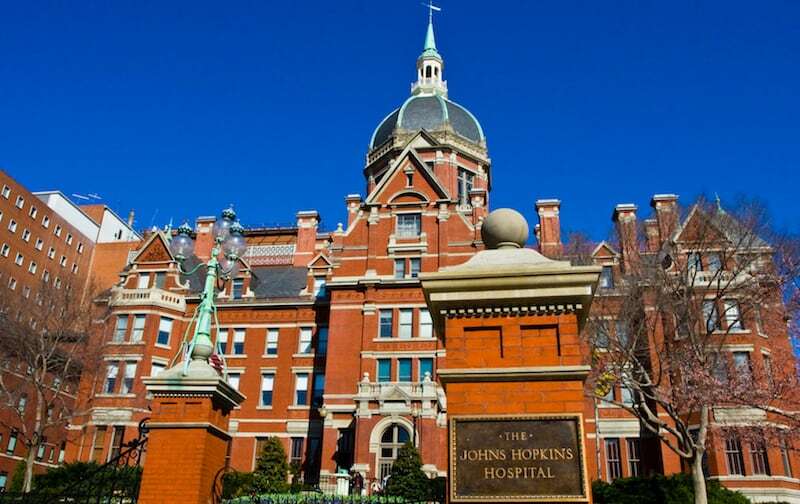 Rhabdomyosarcomas are treated with surgery plus chemotherapy or radiation. The prognosis is based on the extent and resectability of the tumor, the clinical stage (which incorporates location, size and presence of lymph node or distant metastasis) and other factors such as the histologic subtype (botryoid and spindle cell are favorable; alveolar and pleomorphic are unfavorable), age (adult is unfavorable) and myogenin expression (diffuse is unfavorable) (Goldblum, Folpe and Weiss: Enzinger and Weiss’s Soft Tissue Tumors, 6th ed. 2014). 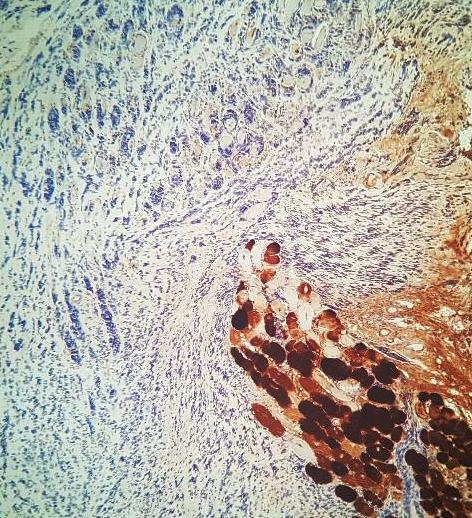 The spindle cell/sclerosing subtype is rare enough that it is unknown whether it has a special prognosis. However, the published case series suggest it may be aggressive, with a mean disease free survival of 17 months and an overall survival of 40 months (Head and Neck Pathol 2015;9:147). Presence of the MYOD1 (L122R) mutation may also signal a poorer prognosis (Modern Pathology 2016;29:1532).